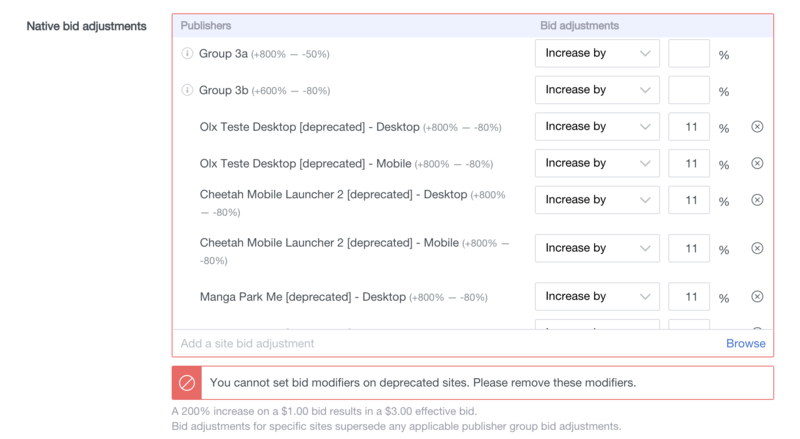 Site Bid Adjustments is a new advanced feature extension to the Native & Search family that allows native advertisers to modify their bids on a per-site, per-device basis on selected sites. They work similarly to group bid adjustments, but with more granularity. Using this feature, you can identify top-performing sites and bid more on just those sites. Conversely, you can identify your worst-performing sites and bid less on just those sites, thus improving your overall campaign performance. 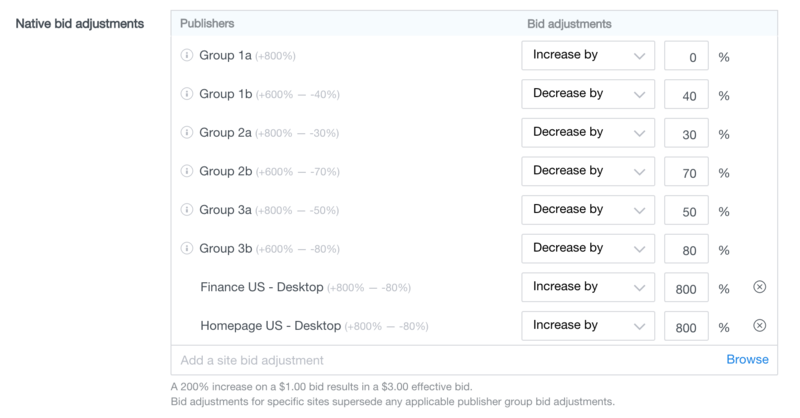 If you have group bid adjustments in place, site bid adjustments override those only for the sites you adjust. For example, if you set a Homepage US - Desktop bid adjustment of +800%, your homepage US desktop bids will be multiplied 9x, regardless of your group bid adjustment settings. However, if you set a Finance US - Desktop bid adjustment but no Homepage US - Desktop bid adjustment, then your homepage US desktop bids will be adjusted according to the group bid adjustments you have set. 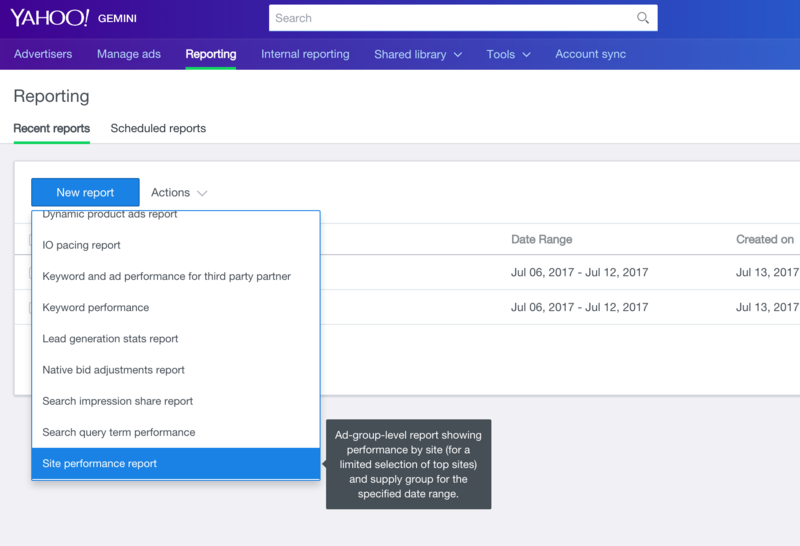 You can view performance information per site in the Site performance report in the Native & Search reporting center. Note that the bid modifier and modified bid information in this report only takes site bid adjustments into account (i.e., it does not include group or other bid adjustments). You can set up site bid adjustments in the Native & Search UI in much the same way as you would set up group bid adjustments. When creating or editing a campaign, you’ll see a Define your audience section with a Native bid adjustments sub-section. At the bottom of the bid adjustments chart is an Add a site bid adjustment bar. Use this bar to search for or browse the available site and device combinations. To remove the bid adjustment for a site, click the x next to that site in the native bid adjustments chart. Remember to add/remove adjustments for both desktop and mobile if you want to adjust your bids for all traffic to a given site! You cannot add more than 300 sites to your campaigns or ad groups. If you add more than 300 sites, an error will appear: You cannot set more than 300 site modifier bid adjustments. Similarly, you won’t be able to perform edits on your campaigns or ad groups if more than 300 sites are selected. The same error message appears: You cannot set more than 300 site modifier bid adjustments. If your campaigns or ad groups have deprecated sites selected, you’ll see this error message: You cannot set bid modifiers on deprecated sites. Please remove these modifiers. The list of sites is still shown, but the deprecated sites are disabled. Once you remove the deprecated sites from the list, you’ll be able to perform edits. Why are only some sites shown? I am targeting the US only, but I see traffic on sites in other countries. What gives? Why are there multiple listings for some sites? Why can’t I set tablet modifiers? We currently only allow site bid adjustments on some of Native & Search’s largest sites. We may expand the site list further in future. User targeting is by the location of the user. However, users can visit other countries’ sites – for instance, French speakers in the US might prefer to visit the French version of Yahoo properties. As a result, you might see traffic on sites outside of the locations you target. This does not mean there is anything wrong with your targeting. In some cases, we have multiple sites from a technical perspective, even if they are the same site from a user perspective. Those will appear separately in reporting and in the site bid adjustments list – feel free to simply apply modifiers to all of them (or to do whatever your data indicates is best). We do not currently expose tablets as a separate device type. Instead, we group them with similar-performing desktop or mobile traffic. To learn more about Native Bid Adjustments which provide you with greater control over your campaign performance, see the section on Using Native Bid Adjustments to Optimize Supply & Device Placement. Site Bid Adjustments are available in Bulk, so you can create, update and delete site x device targets. For more information, refer to Site X Device Targeting in Bulk.